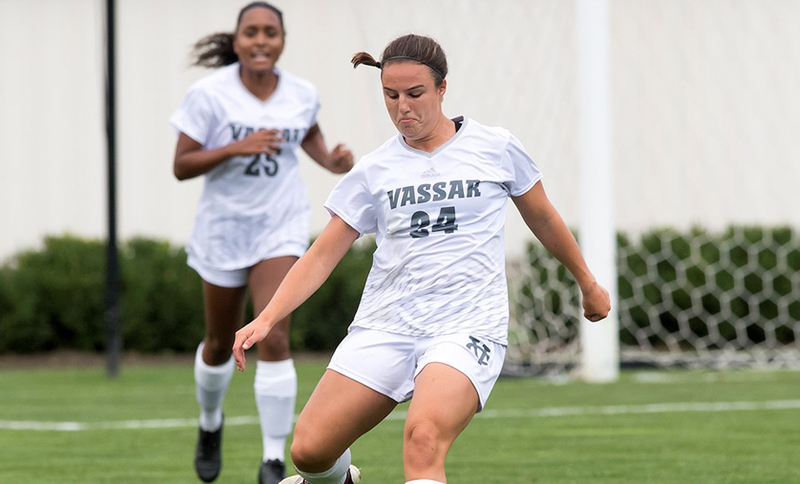 POUGHKEEPSIE – After having its contest against Bard rescheduled and relocated, the Vassar College women’s soccer team returned home (officially) for the first time in three weeks on Saturday afternoon. In a matchup between teams that were tied for second place in the Liberty League, Skidmore (6-3-0, 3-1-0 Liberty) came away with a 1-0 win over the Brewers (6-4-1, 2-2-0 Liberty) at Gordon Field. The only goal of the game came late in the first half. In the 43rd minute, Yasmine Boukari sent a cross to Molly Kosh, and she placed it perfectly over Fiona Walsh’s head and into the upper right corner of the net, giving Skidmore a 1-0 lead. The Brewers had a chance to tie it as time was winding down in the period, but Rachel Chernet’s attempt was saved by Ava Keller. Vassar controlled play for much of the second half. However, despite outshooting Skidmore 10-2 over the final 45 minutes, the Brewers were unable to come up with an equalizer. Vassar’s best scoring chance came with roughly 10 minutes left, as Hannah Daley and Emma Tanner were both denied by Keller before Rebecca Andrews had a shot sail high. Andrews fired five shots in the game, while both of Daley’s attempts went on net. Walsh (5-4-1) took the loss despite making five saves. Kosh’s goal was her first of the season, while Boukari, the Thoroughbreds’ leading scorer, was credited with her second assist. Keller (3-2-0) ended up with six saves, as Vassar was shut out for just the second time this year. Next weekend, Vassar wraps up its three-game homestand with a pair of Liberty League matchups. Clarkson (4-7-1, 0-4-0 Liberty) visits Gordon Field at 4 p.m. on Friday, then the Brewers take on St. Lawrence (6-1-3, 1-1-2 Liberty) Saturday at 2 p.m.